Holidays are not finished until the Philly Secret Santa gift exchange is finished. That’s how I determine the holiday season-starts with Halloween, ends with Philly Secret Santa. I would venture to say that Ian would agree about the end, though I’m not sure about the beginning. Though determining what to make under $30 and all by oneself can be stressful and time-consuming, I have found this gift exchange to be the most fun out of the entire season. I get to look forward to getting something creative and original, made just for me. In addition, the excitement of seeing what everyone else comes up with for gifts adds another layer of anticipation and enjoyment. Having the actual event happen well after most other holiday events gives me a nice span of a week or two to really concentrate on and savor the creative experience. This year, as in past years, there was a point where I just wanted to keep on making things for my person. Elfster drew Beth Connor for my Secret Santa, which left me scratching my head. I couldn’t figure out how to make a gift that would celebrate those traits I most appreciate about her: knowledge of the obscure (I was thinking about making a Magic Pony hook rug), celebration of the nerd inside, and a sardonic sense of humor. After some trial and error, and some vague answers from Beth on what she may like, I settled on terrariums in lab grade boiling flasks and a tea service tray with necktie handles. The terrariums were particularly fun, as it was like constructing a ship in a bottle, only it had dinosaurs and living plants involved. I really liked making up my own tools. The gift that I received for Secret Santa was really amazing. Kevin Nocoins created a mini and a mega Ian head for me. “Because being a therapist can be stressful, but being married to Ian can be REALLY stressful.” I have been very impressed with how Kevin’s gifts have continued to become more and more complex with each passing year. It’s just proof that the challenge to create provides the opportunity to get only better, and in this case bigger (or smaller, depending on which part of the gift we’re talking about). 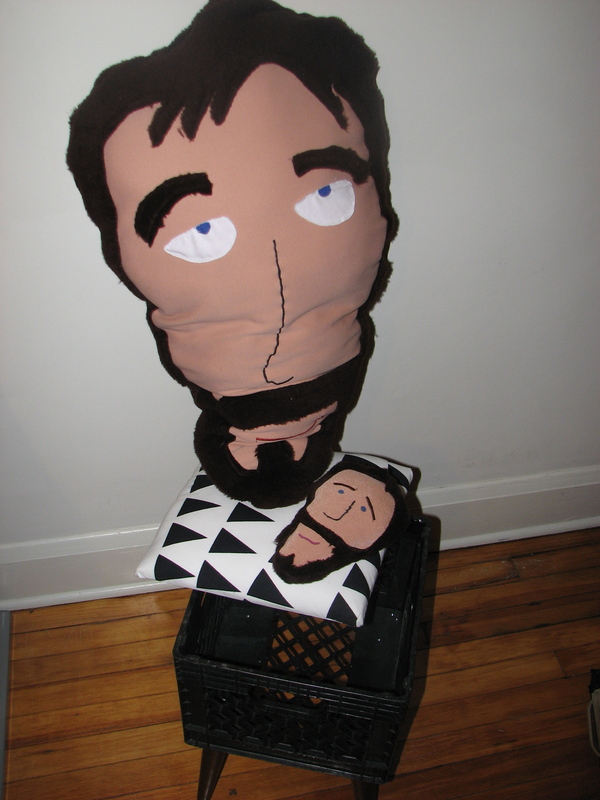 I also would like to point out, that I have found the Ian heads have proven quite helpful. A big pillow that looks like my husband makes the bed a little less empty when he’s off on shoots. And now, I’m going to defer to Ian to review his own gifts. CORRECTION: I will write about Ian’s gifts because it will mean this post gets put up faster. Elfster drew Mickie Cathers for Ian’s Secret Santa. Ian had some ideas of what to make, but felt somewhat stumped. I had recently run into a post on how to make one’s own liqueurs, and had thought that this would be a cool option for Secret Santa. (That’s right, husband, I am claiming the idea as mine first. Teach you to procrastinate.) On reviewing the coffee liqueur recipe by which I had originally been enticed, I didn’t think we could afford to make as much of it as I’d want. Grappa tends to eat up much of the $30 limit and then we have fancy schmancy spices getting involved. Ian had a much more visually exciting and fascinating option: Skittles vodka. Soak candy in vodka, strain, and serve liquid rainbow. 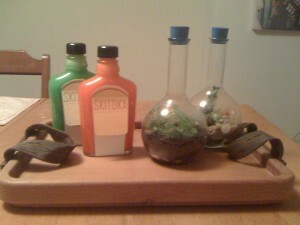 We found that the maple syrup bottles that we had were perfect flasks for the concoctions, too. I will say that Ian came up with some other excellent gift ideas, but ran out of time. I’d describe them here, but I’m afraid that such good ideas may be stolen by Mickie’s 2010 Secret Santa. We don’t want any of that kind of idea exchange, here. They have to work for their ideas, or have their partner come up with it. Either one. I’m not picky. Ian’s Secret Santa was Matt Sutter. Matt made Ian a stool out of a milk carton, crazy ’80s graphics fabric, and the legs of some perfectly good piece of already existing furniture (if one were to ask Niff). I’m not sure what inspired Matt to do so, but it may be the fact that we never have a second seat in Ian’s office. The new addition has been fitting in quite nicely with the rest of the office furnishings. No office drama, as far as I’ve heard. Unless it’s Ian cursing at the computer like it’s served him up some salty ham. This was written by Jes. Posted on Tuesday, February 23, 2010, at 8:43 pm. Filed under Friends. Tagged Philly Secret Santa 09. Bookmark the permalink. Follow comments here with the RSS feed. Trackbacks are closed, but you can post a comment. everyone. So, unless you have any such binding which is not obligatory so that you can stay in cities, you’ll be able to opt to get a job in inter place which may give a higher-level of salary. With higher scrutiny of company finances, as well as the financial world receiving targeted and more complex, it is no surprise to see a greater demand for these experts, CPA jobs, as well as a rise in CPA Salary. it in throughout a persons daily practice. the risk of heart disease, diabetes, and osteoporosis. complete other exercises that can concentrate on the area the place that the muscles have to develop more. some professional breakthrough. It’s filled with services that greatly benefit Internet marketers and assistance to facilitate a high level of learning. extremely smartly written article. I’ll be sure to bookmark it and come back to read extra of your useful info. Thank you for the post. I will definitely comeback.